Right after a workout means before you have had time to train. You want to maximise your training results? Then after your workout is just the right time. 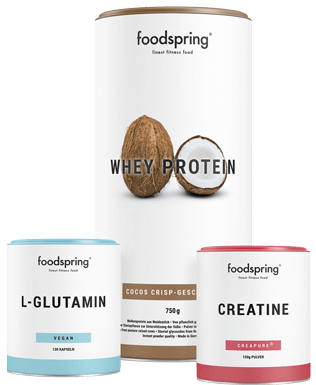 We develop the finest fitness food with foodspring that supports you in meeting your goals. Your muscles are worked a lot harder, especially when doing strength and functional training workouts. Afterwards they need one thing above all: Protein. Our Protein Shakes contain proteins from only the highest quality pasture milk. Whey Protein is the perfect shake after weight training. 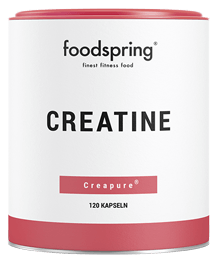 3K and organic protein also give you valuable casein that will provide your muscles with protein for up to 7 hours. 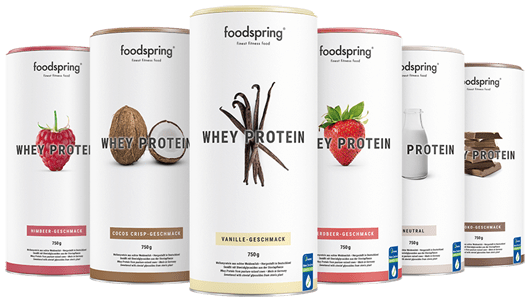 We developed the Vegan Protein for those who prefer plant-based protein, and it combines 4 high quality plant protein sources and is also lactose and soy free. The CocoWhey is refreshing and rich in protein to have after a tough workout. You prefer to snack on something a bit more solid? Then our Protein Bars, air dried Beef Jerky made from pasture cows or our Peanut Butter made of 350 peanuts that are roasted to perfection just for you. The classic for after a workout is the amino acid L-glutamine. 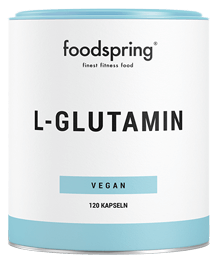 Our L-glutamine is made of plant-based raw materials that come from fermented corn. We are strictly opposed to the use of lesser quality sources like duck feathers. By the way: If you want to get a power boost after any workout, then our packages are just the right thing for you. Muscle building, weight loss, functional training or snack packages: All of our packages are made up by specialists and are fantastic value for money.